Locally owned and operated by Jonathon and Jacqueline McCabe. Heros N Sports was established in 2001, as Pullman's second sandwich shop and also featured sports cards at that time. The cards are somewhat limited now but we still have about 650,000 +/- ....if you are looking for something in particular. We pride ourselves on Fresh Homemade Soup most days, sometimes two kinds and Chili. Check out our Panini's, Grilled Wraps, Hot Sandwiches, Subs, Salads and more! If you want something Fresh and Different go where the locals flock to! "If you're looking for an alternative to Subway, check out Heros N Sports." "Great people, great service, great salads and wraps." "True locally owned business, the environment is cozy and enjoyable." 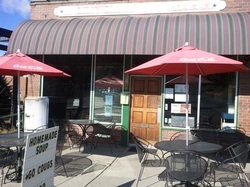 "The wraps, home made soups, paninis and best of all the sandwiches are to die for!! "They have very good prices and very nice staff. They once gave me a small soup for coming in so often." Find us on Facebook for specials, deals and more! You can find us in between the two railroad tracks and across from the Spot Shop.